Knife River Corp., a North Dakota-headquartered company with which motorists in the Wood River Valley became acquainted last year, has been awarded two new contracts for highway work this spring in Blaine County. The Idaho Transportation Department reported Thursday that Knife River was the low bidder on two highway resurfacing projects in the vicinity of Timmerman Junction, one on state Highway 75 and the other on U.S. Highway 20, worth a total of about $2.75 million. "They're the low bidder, and we don't get to choose our contractors," said ITD spokesman Nathan Jerke. "They do the choosing for us." Knife River was also awarded a $4.23 million contract from the city of Hailey in March for reconstruction of Woodside Boulevard. That work is expected to start later this month. Besides those projects, Knife River has unfinished business on two other Blaine County highway projects that the company started but didn't finish last summer. Jerke said Knife River is expected to be working in late May and into June on the two new resurfacing projects near Timmerman Junction. One, called the Poison Creek Project, is a $2.04 million resurfacing of a 10-mile stretch of U.S. Highway 20 on either side of Timmerman. Jerke said Knife River is contracted to put a 2-inch asphalt overlay on seven miles of the highway west of the junction and on three miles of the highway east of it. That work will be followed by a seal-coat cap on the new surface. Also included in the project is maintenance work on the highway bridge over the Big Wood River near Stanton Crossing. The second project, worth $707,000, involves a 2-inch asphalt overlay on 3.6 miles of state Highway 75 on either side of Timmerman Junction. Jerke said the work will start at the entrance point to the junction rest area south of the intersection and will run north to milepost 105.6, which was the ending point of a resurfacing project that Knife River did last summer on the highway from Bellevue south. "These are small, short-duration projects that should be pretty painless," Jerke said. ITD also recently awarded a contract for reconstruction of an eight-mile section of Highway 75 from Shoshone north. Jerke said Knife River was not the low bidder on that project and the $13.2 million contract went to Idaho Sand and Gravel. Knife River will also be working on two other Highway 75 projects in Blaine County that didn't get finished last year. Jerke said that in July or August, the company will put a chip-seal coat on the 28-mile section of highway that it resurfaced last summer north of Ketchum between Frenchman Creek and Stanley. Also in July or August, Knife River is expected to put a micro-seal on about 6.75 miles of highway in the Wood River Valley. The work involves a stretch of highway between Hailey and Timber Way just north of East Fork Road and another stretch from the bridge over the Big Wood River south of Elkhorn Road north into Ketchum. That work was left undone last year because colder weather set in before the micro-seal could be applied. 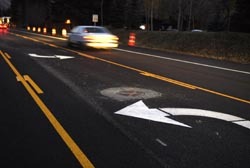 Knife River did install a micro-seal on the 3.25 mile stretch of highway between Timber Way and the Big Wood River bridge south of Elkhorn Road, but due to "faulty compaction" much of that micro-seal has already deteriorated. Jerke said ITD does not plan to reinstall the micro-seal in that area because that section of highway is due for reconstruction in 2013. "With the project coming next year, hopefully what's there will last until next year when it will all be coming up," Jerke said. "We'll rely on our maintenance men to go out and keep that in as good a condition as they can for the next 12 months."